In this chaotic, desperate storm the brain tries hard to gather its fragmented parts, and anchor down the guy lines. To weather out this hopelessness, this turmoil and this pain, -prevent disintegration until the calm returns and clear skies come again.In this chaotic, desperate storm the brain tries hard to gather its fragmented parts, and anchor down the guy lines. To weather out this hopelessness, this turmoil and this pain, -prevent disintegration until the calm returns and clear skies come again. Mary is a General Practitioner, a Family Doctor, and became anorexic and depressed at age 12. She writes of the chaos and pain of her life, through her abnormal adolescence and adult years, to the equilibrium of the current day. 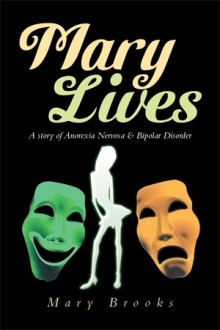 It is an enlightening and inspiring story of Anorexia Nervosa and Bipolar Affective Disorder or Manic Depression.